As data center and end-user applications continue to proliferate, bandwidth demand continues to multiply, resulting in significant changes to the patterns, dynamics, and scale of traffic within metro networks. The 5170 is purpose-built to provide seamless MEF-compliant along with L2 and L3 services over a carrier-class, connection-oriented infrastructure using MPLS. It enables 100GbE service delivery or 10GbE service aggregation in an energy and footprint efficient form factor. Space is increasingly limited and expensive, and network operators face substantial capital expenditures to activate new locations or must retire active equipment in data centers to free space for adding new services. Addressing bandwidth demand growth by deploying more and larger equipment is simply not a sustainable business model. The footprint and power efficiency of the 5170 allows the addition of 10GbE services without growing the operator’s footprint. Service velocity has become a critical competitive advantage for network operators. In many cases, service velocity is the determining factor in winning new service sales. 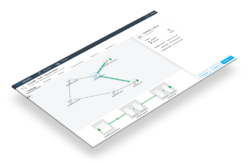 The 5170 implements Ciena’s unique ZTP capabilities, allowing network operators to rapidly deploy new packet-based services in a completely automated manner. With no human intervention required, manual provisioning errors are eliminated, and costly truck rolls can be avoided. Most importantly, ZTP improves service deployment velocity and significant competitive advantage. Want to know more about the 5170? Let's talk.